I've only recently discovered Alon Nechushtan's music (as leader) over the last year. 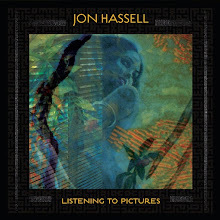 Releasing two radically different records in 2011 is surprising. But for both to be so solid and inspiring is strong evidence that Nechushtan is becoming a important name on the scene. I've discussed his early 2011 album, Words Beyond, with the latter year end release of Dark Forces, Nechushtan has made wider leap forward in the avant garde community. Dark Forces is cerebral--and yes, dark. You might even call it, "a headphone record." Originally written and performed in live in 2006 (only now finally put on record), is densely packed with layers of slightly audible tones. This is a large ensemble spread over ten movements. And while each member doesn't really standout (probably by Nechushtan's design), the overall sum of the parts is intense and very rewarding. "Dark Forces II" employes a number of manipulated effects and electronics surrounded by some haunting sounds by the wind instruments. With "Dark Force III," Nechushtan manages to blend an ethereal esthetic into classical realism which makes for a fascinating experience. Both Dresser and Lee have some heavy exchanges which carry the piece through beautifully. "Dark Forces VII" rolls along hypnotically on the found sounds and Wooley's ghostly trumpet. The guitars quietly blend into the background allowing Rojas to rise up in the mix. 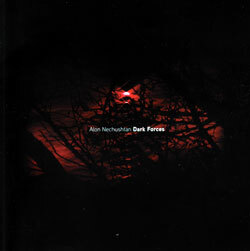 "Dark Forces X" leaves its final impression like a piece that could easily slide along side a Throbbing Gristle record. Dark Forces feels like it could easily be a work for installations or an experimental dance company. But as a stand alone piece, Dark Forces is a deceptively effective work from a composer who seems to be a great more adventurous with each record. Well worth seeking out.